Windsor 393 & 347 CI combo. The 393 CI engine is rated at 560hp@6200rpm with 530lbf@3800rpm whilst the 347 CI engine is rated at 490hp@6900rpm with 460lbf@4600rpm. These engines come completely assembled and ready to bolt in. These engines are perfect for both everyday street use and bracket racing. Engine turn around time is approximately 3 – 4 weeks. Engine installation available upon request. For more details contact us. • New Ford Racing Sportsman block. • Arias forged pistons 11.0 compression. • Child & Albert piston rings. • High energy 7 litre oil pan. • Melling high volume oil pump. • Premium double row timing chain. 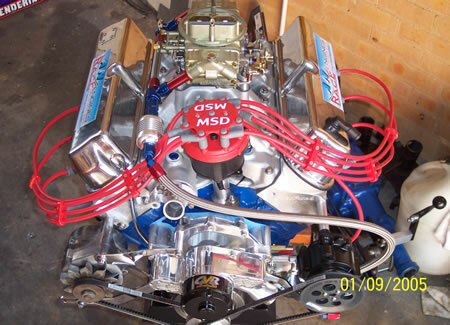 • Custom ground solid cam shaft kit direct from the US. • New Ford timing cover. • CVR electric water pump. • Yella Terra steel flywheel or B&M drive plate for automatics. • Hays Street & Strip clutch kit (if applicable). • Edelbrock victor junior alloy heads. • Edelbrock victor junior intake manifold. • Holley 750 double pumper. • Russell fuel rail and fittings. • Cecere 1 inch spacer. • ARP stainless engine bolt kit. • MSD super conductor ignition leads. • MSD 6AL ignition box. • Billet aluminum crank pulley. • Felpro o-ring head gaskets. • Felpro premium gasket kit. • Denso vacuum pump with moroso pulley. • Holley high volume fuel pump. Cleveland 383 and 408 CI combo. The 383 CI engine is rated at 580hp@7200rpm with 480lbf@4800rpm whilst the 408 CI engine is rated at 600hp@6600rpm with 510lbf@4200rpm. These engines come completely assembled and ready to bolt in. These engines are perfect for both everyday street use and bracket racing. Engine turn around time is approximately 3 – 4 weeks. Engine installation available upon request. For more details contact us. • CHI 218cc alloy heads. • CHI water crossover kit.